For four long years we had to deal with serious dog aggression issues between Buck and Chief. Serious as: if left alone Chief would get killed by Buck. Simple like that. 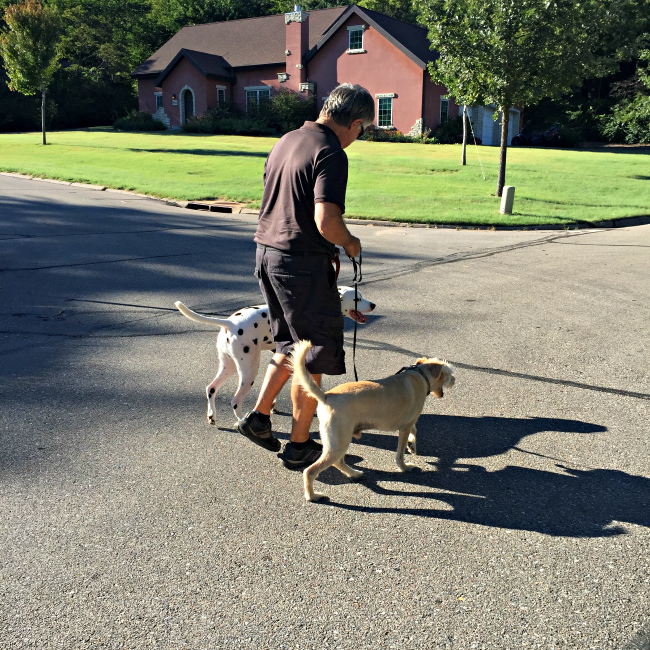 It was a huge challenge to keep it all under control for such a long time, and for obvious reasons we were worried about bringing Bogey, an adult, strong-willed dalmatian to our home. After getting advice from our friend Cindy and also reading a lot of stuff online, we planned our strategy. Phil would pick up the dogs at the kennel, I would stay with Bogey in the house. When he arrived, we would take first Oscar and Bogey for a walk together. I would be outside the house (neutral territory) with Bogey on a leash, Phil would bring Oscar with him, also on a leash. We would go up and down the street, then release them in the backyard. Let them be there for a while, then do the same with Buck (the problem child) and Bogey. I cannot tell you how nervous and anxious I was. First thing that happened, Oscar and Bogey snapped at each other. Not too bad, but that was their first hello, and my world seemed to collapse a little. Phil did not let that bother him, decided it was a normal reaction and we should follow with our plans. Soon they started sniffing each other’s behinds, and apparently they liked what they sniffed. They hung out together in the backyard, no issues. Here’s the amazing turn of events: Buck behaves like a pot of honey, whereas the one causing a bit of trouble is Oscar, very jealous of me. He is always following Bogey and showing his displeasure for him being around. He lies on Bogey’s bed the moment Bogey stands up and leaves his spot, grabs his toys and takes them away, just like a spoiled brat. Yeah, that’s our Oscar. But he is not a fool and knows not to pick a fight with a dog who outweighs him by more than 40 pounds. So we turned a big page and life should slowly get back into a new routine. Bogey has a lot of adjustment to go through. He was used to sleeping in a bed cuddling with his Mom, he was always inside staring at the window and furiously barking at passing cars and dogs… Now he will be part of The Pack of the Fabulous Three. I thank my friend Elaine for the term, by the way, although truth be told, her real term was “The Fabulous Five.” Is she super nice or what? How wonderful! Ever since I read of your homecoming on Elaine’s blog I have been wondering whether Bogey was with you and how things would pan out . . . thank you so much for letting us all know about the newest member of your home settling in so promptly. Just a degree of sadness of why this all came about. All the bestest . . . This made me cry tears of real joy. I’m thrilled that the five of you are a true pack. All three of them are beautiful. Loved the post – what an amazing trio, I mean, quintet! I’m amazed at the amount of work and thinking that was put in before “the encounter” and I’m really pleased all is going fine. More installments, please!!! 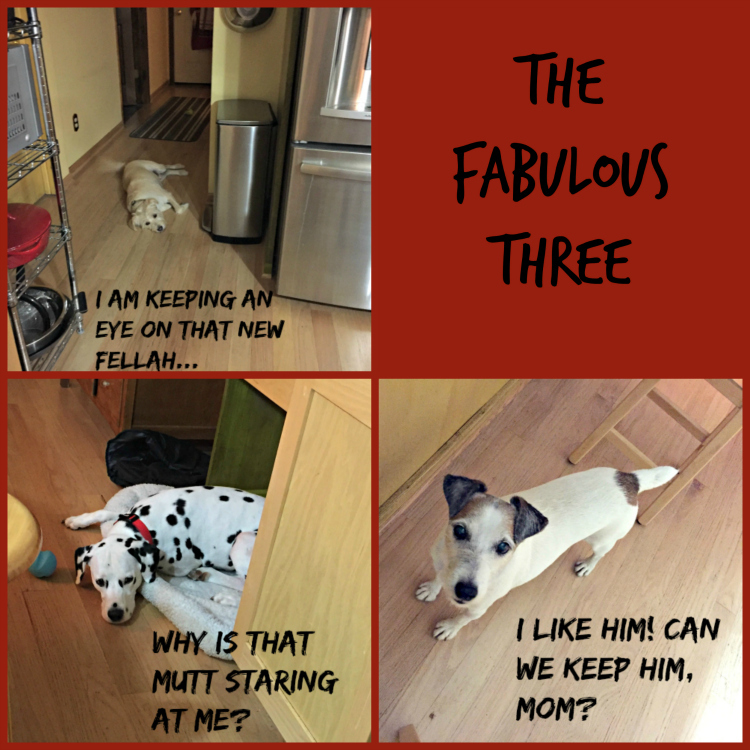 I will definitely be sharing more adventures of The Pack of the Fabulous Three… so stay tuned! Oh my – good luck. Damn male dogs. We’ve inherited our daughter’s dog, so two of our three dogs are little 9 pound dogs. And some times they get in to it, usually because of something territorial, and it is so scary. Even though they’re so little. I hope things continue to go smoothly. And again, I’m so sorry for your loss. SOme of the fights between Buck and CHief were so incredibly violent, like wolves ready to fight to death – I never want to go through that again…. (if at all possible!) – Oscar seems to be the dominant and Bogey seems happy to accept that. So far…. So far so good. Those are some great looking dogs. Well done! Yes, they are pretty cute, and Bogey a very handsome dalmatian, although a bit bigger than the optimal size for the breed. We would never turn him in to a show dog, so no problems there. a pack and as dogs are pack animals that is important to their survival. I just got caught up a bit on your news. I’m so sorry for your loss of your sister-in-law. Nice to see that good news followed soon with your new addition. Hope the doggies are doing great! So far all good, each day a little easier – right now Bogey is passed out by my feet – he looks so peaceful, it makes me happy…. Wonderful!!!! Xoxo Thinking of all of you. Same here….. wish we were not so far away…. say hello to the crowd! So glad that they are settling in well together. Love them all! You are so blessed to have it all planned out and MOSTLY it went as planned. Your fabulous five sounds great. Indeed! I cannot tell you how relieved we are….. the driving trip from Portland took 29 hours, divided in four days – we had plenty of time to worry…. it wasn’t easy! I have been checking here almost every day waiting for this. Your plan to integrate Bogey was a really good one and one we have used successfully before. You and Phil provide such a good pack atmosphere that Bogey will slide right in and the group will function to your heart’s delight. In fact I think in his new lifestyle Bogey is going to become the most balanced and least stressed he may ever have been . And good on you and Phil — everyone’s worst nightmare is what is going to happen to a beloved pet when its owner passes away — what a wonderful thing you have done. Thank you so much! That was a wonderful comment to read, warmed my heart! Sally… this post made me so happy ~ ♥ ~ I loved reading about your adventures and introductions. Congratulations to the Fabulous 5 and Welcome Bogey!